Spinal scoliosis is curvature of the spine, so that from the rear view it has an ‘S’ shaped or windswept curve from top to bottom instead of being completely straight. 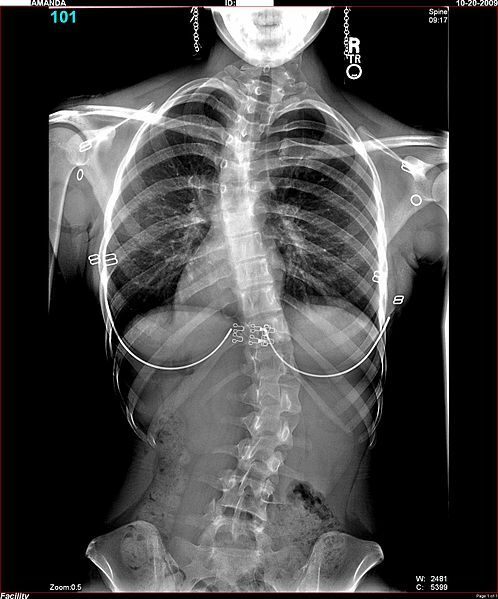 Of all the congenital spine disorders, a spinal scoliosis diagnosis is the most remarkable in terms of variability and severity of symptoms. The crooked spine may be barely noticeable or shockingly marked, as with Quasimodo the Hunchback of Notre Dame. Quasimodo's hunch was caused by his rib cage, twisted around his spine and and thrust up at one side of the back like a fin. 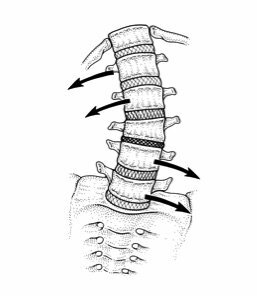 When the spine bends into its sideways hoops the spinal segments also rotate on their axes, twisting one way above the apex and the other way below. Part of spinal mobilisation treatment is to gently de-rotate these segments manually. Although this never fully straightens the spine, it loosens the segments and make them move more comfortably beside one another. 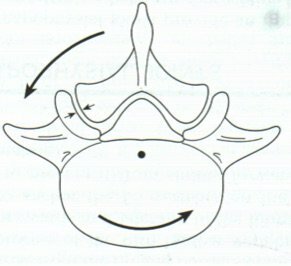 The spinal segment at the peak of the apex, known and the apical segment, is always the stiffest and the most painful. It can refer pain out either side, be it neck, thorax or lower back. 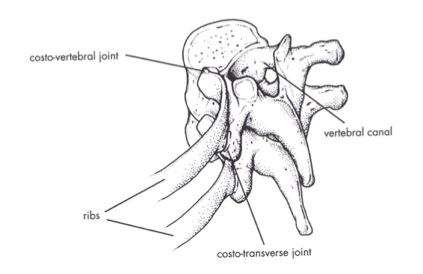 The facet joints on one side of the spine are shut by the segments rotating one way, while on the other side they are opened. Either side can refer pain to the side of the spine. 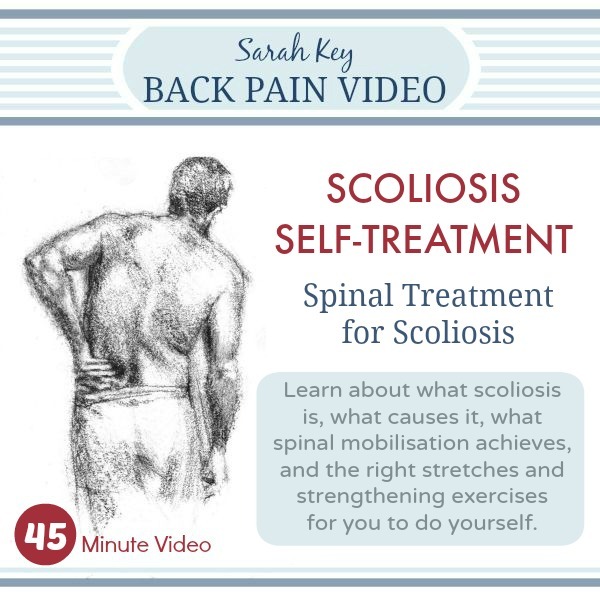 You can download Sarah comprehensive video on scoliosis here. It explains the A-Z of scoliosis and how to treat it yourself - both with exercise and using the BackBlock. This video is a must-view for anybody with spinal scoliosis. 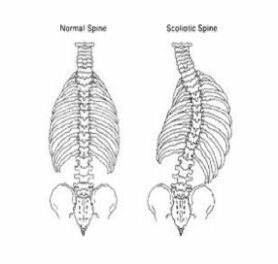 The twist through the spine of a thoracic scoliosis has a marked effect on the rib junctions, with pain from the awkward rib attachment some of the worst from a scoliotic spine. The pain can pierce through to the front of the chest like an arrow, or follow the line of the rib around to the front in a girdle distribution. Mobilisation of the ribs by a therapist followed up by self treatment can profoundly reduce this pain. The lateral curvature of scoliosis causes the spine to be inherently unstable, making it easier for the upper body to slew forward and become fixed in front of the liner of gravity. This can cause a forward hump through the thoraco-lumbar junction (a kyphosis) in addition to the scoliosis - known as a kyphoscoliosis. 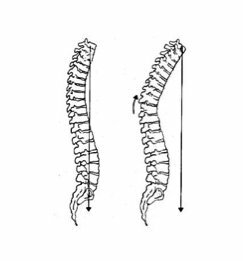 In these cases, the apex of each curve coincides at roughly the same level making this part of the spine doubly painful. This condition is ideally suited to conservative spinal mobilisation, self treatment by using the BackBlock and spinal strengthening exercises. Read the dedicated chapter on spinal scoliosis. This book has been in print since 1986, with the Foreword by HRH The Prince of Wales. 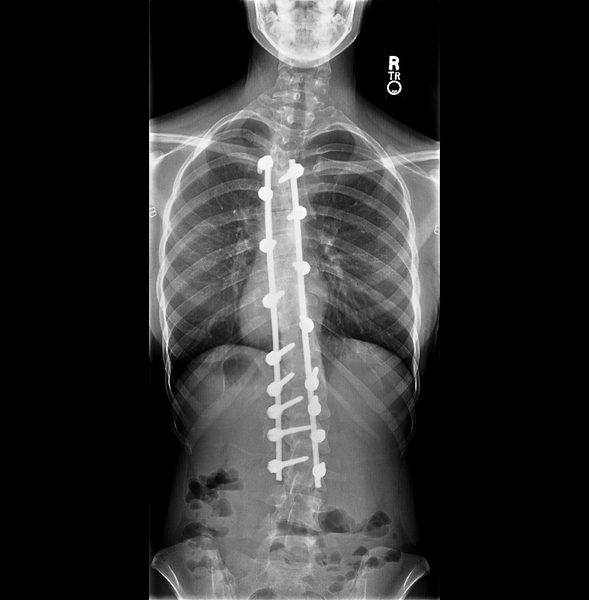 Pain from a scoliosis is not a good reason for spinal fusion surgery. (Indeed, the case in the photograph at the top of the page and immediately above - having being fused with Harrington Rods - hardly seems to warrant this intervention). Only in cases where the scoliotic curves are rapidly increasing over months, if not weeks, should this intervention be admitted. 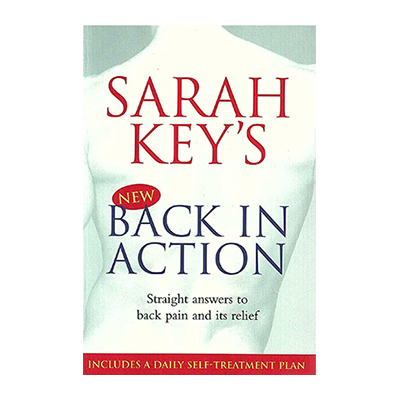 Before entertaining ideas of spinal fusion it is a good idea to read Sarah Key's eBook Be Careful About Back Surgery.